Hassan Akhras, Alex Hirschi, Fred Fugen, Vince Reffet and Raha Moharrak came together to test the limits of their endurance over a day all while displaying the soon-to-be released exclusive Dubai Special Edition of the Connected Watch Modular 45. To mark the upcoming post-Eid release of the Dubai Special Edition of the Connected Watch Modular 45, which was first unveiled at the Arabian Travel Market this April, TAG Heuerinvited five very special friends of the brand – including Hassan Akhras of Arab Watch Guide who will be undertaking the next Iron Man; extreme-sport athletes Fred Fugen and Vince Reffet who base-jumped off The Burj Khalifa and are popularly known as The Soul Flyers; Raha Moharrak the youngest Arab and first Saudi woman to conquer Mount Everest; and Alex Hirschi better known as Supercar Blondie who is followed for the exciting content she generates mainly around supercars in Dubai – to undertake an exhilarating day of activity all while flaunting the durable and versatile Dubai version of the Connected Watch Modular 45. The watch is a living testimony to an encounter between TAG Heuer and the Dubai Department of Tourism & Commerce Marketing (DTCM) and combines Swiss watchmaking tradition and the TAG Heuer Avant-Garde spirit with the modern aesthetic of Dubai, all aspects that are touched upon in the video while displaying the watch set against the vibrant and diverse backdrop of the city and highlighted as the group of five move from desert to skydiving zone to the autodrome arena and finally a contemporary urban hotel. All five friends of the brand donned the watch from the beginning of their action-packed day, which kicked off in the desert at 5:00 am, right through to the subsequent challenges they took on while skydiving at Skydive Dubai at 11:00 am, car drifting at the Dubai Autodrome at 14:00 pm and while cross training at 17:00 pm at the rooftop of a contemporary hotel overlooking Burj Khalifa and under the training of Bare Gym coaches. Throughout the video, useful features of the watch such as its in-built GPS and interchangeable strap are emphasized, drawing to attention the fact that this is a timepiece which can really step up to a challenge under extreme conditions. Priced at AED 8,000, each watch will come with a special case back and will be mounted on a brown calfskin strap with rubber lining and an exclusive “DUBAI” embossing. It will also have a spare strap in the unmistakable shade of blue associated with DTCM. The watch faces, themselves, will boast three innovative looks. 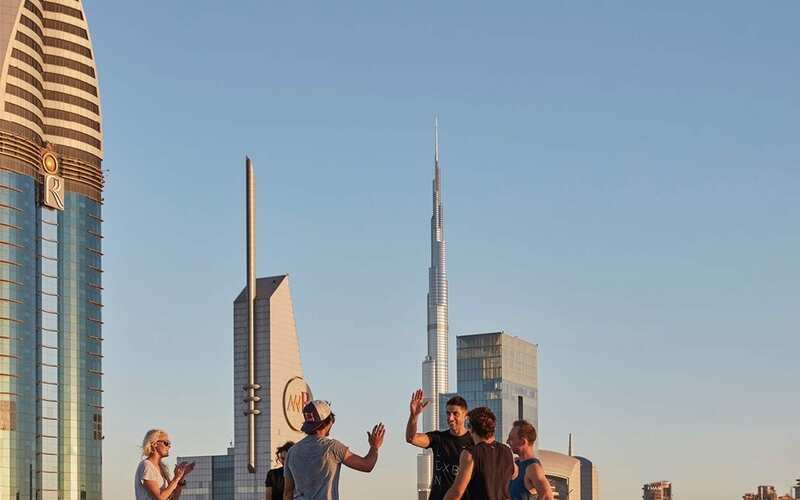 The first option will allude to the fact that Dubai is a “City That Never Sleeps”, the second is titled “The Land of Desert and Sea” and recreates a sense of tranquility that takes users on a sensory voyage and the third titled “Your Time, Our Essence”, focuses on icons that represent Dubai and its culture.